A bright student and a renowned sportsman at S. Thomas’ College Mt Lavinia, on leaving college, entered the University of Colombo to do his pre-medical studies. He grew up with the industry and the industry grew with him. A pioneering insurance virtuoso in a career spanning a record 55 years, business magnate, dairy farming entrepreneur, S. Thomas’ double coloursman at cricket and hockey, national selector for both sports and manager of the Sri Lankan cricket team, might aptly sum up the rich and variegated lifelines of retired Janashakthi Insurance founder Managing Director/ CEO, Chandra Thomas Adolphus Schaffter. 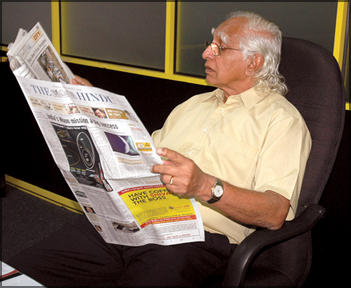 “The biggest achievement in my professional life was when Janashakthi acquired the 100% stake in the National Insurance Corporation, and also in the light of Janashakthi’s very entry into the Sri Lankan insurance market was stiffly resisted by the then existing players,” the 78- year old silver haired grandfather solemnly prophesised without any airs or much ado about his career accomplishments, an embodiment of his simplicity and gracious charm. The setting up of Janashakthi was one of the biggest challenges that I faced in my 55 year old insurance career where there was stiff opposition from the rest of the market as they did not want another new player. We somehow got to our targets resisting all opposition, he reminisced. Janashakthi Life Insurance Co. Ltd was set up as a largely family owned holding and some of the key corporate shareholders were Bank of Ceylon, its listed subsidiary Merchant Bank of Sri Lanka, the National Development Bank and Chemical Industries Colombo PLC. The founder Chairman was Deshamanaya Nissanka Wijewardene, himself Chairman of the Bank of Ceylon during the J.R. Jayewardene Presidency. A year later, Janashakthi General Insurance, largely family owned by the Schaffters, was also formed. Five years later saw the merger of the two and renamed Janashakthi Insurance Co. Ltd and along with it the acquisition of the National Insurance Corporation, which he believes was his greatest career benchmark. A sum of Rs. 450 million was paid for the 51% and a proportionate amount for the remaining 49%. “The National Insurance Corporation acquisition gave us a real facelift and which made the company rise rapidly to emerge as the third player in the market and a force to reckon with over 2000 staffers. The requirement was only 750 employees and the balance was retrenched on a Voluntary Retirement Scheme in one of the smoothest transitions,” he said. “Janashakthi’s commitment to policyholders was further manifest when it paid Rs. 4 billion to tsunami victims which was the largest amount paid by any insurer without a dent to its cash flows,” he said with conspicuous pride. Commencing what was to be a very fulfilling professional career in insurance, he joined Ceylon Insurance Co. Ltd (forerunner to Ceylinco) as a junior Insurance Clerk. That was a time that competition was intense with over 50 international companies based in Sri Lanka. But Ceylon Insurance was the only then company with the local flavour. A year later, he was offered a better break at Manufacturers Life Insurance Co. Ltd, the Colombo office of a Canadian re-insurer. Then he joined the Insurance Department of blue chip Carsons Cumberbatch as an Executive and was later promoted Manager of the Insurance Department. Chandra, known for his deeply entrenched family sentiments as both doting husband and father took up insurance consultancies in the Southern Indian city of Madras where his four children Prakash, Ramesh, Dinesh and daughter Manjula had their collegiate education. Later they had their tertiary education in England. It was also at the time that he was in India that saw a dramatic transformation in the Indian insurance industry which was nationalised. There was a lot of scope in the Indian insurance industry and they do not hire you unless you are really good, he said. Some of the Indian giants that Chandra was a consultant to were Oberoi Hotels, motor giant TVS and plantation companies such as AV Thomas. It was after India that Chandra decided to set up his own Insurance company- Protection and Indemnity Ltd another Principal Agent for National Insurance Corporation where he took the other giant competitors such as Carsons, Aitken Spence, Mercantile Credit and others head on. This was followed by the establishing of Janashakthi. He also explained in detail how automation of the industry had been revolutionised the industry. In the days of yore, all the entries were made manually and the only communication mode was only a telephone, he said. With the advent of the open economy, he also set up Swiss Cheese Company for processing cottage cheese but had diversified into fresh milk, yoghurt and Ice Creams. This is also a billion rupee company today and listed, he said. Chandra was star cricketer and opening bowler at S. Thomas’ College, Mt Lavinia from 1947- 1950, captaining a few matches in his last year. He believes his best performance at a Royal-Thomian was in 1949 under the captaincy of S.J. Thambiah (later Harvard University Professor of Anthropology) where he took 6/25 against Channa Gunasekera’s Royalists. I took a few five - wicket hauls that season which also included Trinity but I cannot remember the figures, he said. Chandra was also a member of the college hockey team playing four years but not fortunate enough to captain. He made his cricket debut for Sri Lanka under F.C. De Saram in 1955 against the visiting England Cricket team led by Sir Leonard Hutton, the latter who once had the highest ever test score of 364. Chandra also represented Sri Lanka at Hockey under A. Mailvaganam against Pakistan in 1955. Some of his most fulfilling moments was as Manager of the Sri Lankan Cricket team led by Bandula Warnapura against India in 1982 (where Vice Captain Duleep Mendis scored twin centuries at the Chepauk Stadium at Madras) under Aravinda De Silva in 1991 and under Sanath Jayasuriya in both 1999 and 2002. The 1999 home tour against Australia was most fulfilling as Sri Lanka beat Australia in the Test and ODI series after being routed at the World Cup after being defending champions. The triangular tournament was with India as the third team. The 1992 series was also a tri-nation tournament between Sri Lanka, India and England followed by the test series against England. Chandra is a relaxed man now. He does some voluntary jobs for Janashakthi. Son Prakash has taken over as Managing Director/ CEO. Ramesh is also a Director. Dinesh is managing another business while daughter Manjula runs Swiss Cheese.